...that Sergeant Johnson was the first human to kill a member of the Covenant, and a witness to the Prophet of Truth's death, making him the only human to have witnessed both the beginning and ending of the Human-Covenant War? ...that while the SPARTAN-IVs' biological enhancements are less potent than those of their predecessors, their more advanced GEN2 MJOLNIR armor compensates for this? ...that a glitch can take players above the Halo 2 level The Oracle? "WE'VE GOT A NEW CONTACT, UNKNOWN CLASSIFICATION!" This article has new content coming soon, and may not be complete, confirmed or correct. Please update it as soon as any relevant and accurate material is available. Halo: Smoke and Shadow is a novella by Kelly Gay set in the Halo universe. It was released in digital formats on November 28, 2016, with a print version released on January 16, 2018. The first part of Smoke and Shadow was featured in Halo: Fractures as the short story Into the Fire. A sequel, Halo: Renegades, was released on February 19, 2019. The story opens in the city of New Tyne on the colony Venezia in January 2557, where Rion Forge oversees a sale of salvaged weapons to a Sangheili customer. Drinking at a bar with the money earned a month earlier selling Forerunner technology, she considers the financial rewards for recovering and using a luminary to hunt down other relics while sitting with a fellow businesswoman, a T'vaoan salvage dealer named Nor Fel who she provided a stasis field generator to earlier that day. Having formed a close business relationship over the past few years since her mate's death, Nor Fel trusts Rion enough to go on a salvage mission to recover an object that would keep them wealthy for the rest of their lives. Rion returns to her ship and prepares her crew for a new mission; this displeases her crew members Lessa and Kip, who were promised time off after a six week journey. Rion and Lessa head to Tiny Birds, a bar in New Tyne run by Rouse and popular among alien customers. There, Rouse provides Rion with a single photograph of a ship, demanding 40,000cR for the location and 25% of the revenue. After some negotiation, they agree on 10,000 cR and 15% on the grounds the aged appearance of the ship could mean it was already cleaned by salvagers. The two leave the bar and head onboard their ship, the Ace of Spades. Onboard the crew conduct a meeting over their new job. Kip is the first to express concern, as he believes they will be recovering a UNSC ship, which salvaging is restricted due to the UNSC Salvage Directive. Niko assures him however that the directive is unenforceable due to the Post-War condition of both the UNSC and the UEG's control over the colonies in general, and the few Outer Colonies in particular. Rion, otherwise, sees no problem to be had with the UNSC, who are known to re-buy recovered materiel from New Tyne anyway, though she is unwilling to take weapons of mass destruction to the depot and instead offers to report it to the Salvage Directive. With the crew in agreement over the mission, Rio confirms the ship is in the Ectanus 45 system, which the UEG lost in 2535 with the glassing of Chi Rho. A small post-war settlement exists on its moon, Eiro, with the ship crashed nearby. The Ace of Spades arrives in the system and lands on Eiro, a frozen wasteland. The crew depart in heavy winter gear to begin their search on the moon's dark side. Finding the ship, Kip immediately identifies it as the wreckage of a Halcyon-class cruiser, a class he once had a model of as a child. Examining it closer, they find only a quarter of the ship (the foreward section) at the location, it having been cut in half in what Cade theorizes to have been some kind of Covenant energy beam during the Battle of Chi Rho. Rion orders the crew to split up to search for anything salvage-worthy: she and Kip are to check the communications; navigation and weapons systems; Cade to one of the armories near the bridge, and Lessa and Niko to the medical bay and the cryo chambers. The crew begin their search by walking through the sliced 'rear', which Rion ominously compares with a gateway to hell due to the collapsed decks near the cut. Rion and Kip get close to the bridge after 45 minutes of walking; despite having a map of the ship the damage to the ship is extensive and many corridors unusable. Rion and Kip notice that in all that time they found no corpses of the crew, though are hopeful the ship was successfully evacuated. As her father disappeared with the missing UNSC Spirit of Fire twenty years earlier, Rion sees it as her duty to report everything they can to the families of the crew and its marine complement so they finally have closure. They get within meters of the bridge only to find that blast doors were lowered over that section. Kip notices the ship's name on one wall, identifying it as the UNSC Roman Blue. Rion alerts Niko over her radio to their discovery, who begins looking up records on the ship. Cade meanwhile reports in that the ship crashed with a profitable payload of body armor; thermite paste; jet packs, various rifles and small arms along with "heavy ordnance" which the crew by Rion's rules are to keep onboard and report to the UNSC. Lessa reports her search of the medical facilities as somewhat productive, though it is significantly damaged and she has yet to check the pharmacy for drugs to salvage. Niko meanwhile notes the ship had ejected some of its cryo pods before crashing, with the rest of the bay in a bad condition. He continues that there is no recent talk on the ChatterNet on the Roman Blue, and dubs it a ghost ship; Rion suspects this means the UNSC to be actively restricting communication on the ship and decides to leak information on its location and the cause of its destruction to the families when the UNSC compensates her for the discovery. Rion sends Kip off to help Niko, and decides to continue her exploration of the ship alone, going to the Captain William Webb's quarters to find more information that could help the families of the ship's crew. There, Rion recovers a data chip, which she places in her COM pad to provide her with personal logs. Rion reads an entry from March 2531, which she recognizes as the date of her father's disappearance. In the log, Webb describes being fresh on board following Captain Hood's transfer to the UNSC Burlington while the Roman Blue undergoes a month of repairs following its unauthorized engagement with the Radiant Perception near Arcadia. Webb laments the loss of the Spirit of Fire, which he blamed on Hood's engagement allowing the Radiant Perception to recover a log buoy the Spirit of Fire left detailing its course. As the log ends, the ship begins to shake. Cade reports that someone is firing at the ship. Rion orders the others to evacuate the ship and ignore her, despite being so far from the way out. Rather than go with them, she insists on searching the ship further for any data relating to the buoy. The crashed Roman Blue is being bombarded from a ship orbiting Eiro. Rion's equipment picks up the increasing heat on the hull, indicating plasma is being used. Deep within the wreckage, Rion knows her chances of survival are slim as the hull begins to melt. The floors and walls begin to twist and turn as the ship collapses in on its starboard side. Rion, her suit suffering damage, jumps out of an opening and onto the moon's surface. Her suit is so hot from plasma exposure it sublimes the snowy surface she lands on and covers her in steam. Rion takes cover behind a rock as the heat front from the plasma weapons spreads to the surrounding area. She passes out from the heat. Rion wakes up later to find the Roman Blue totally destroyed, but with Eiro and the Ace of Spades intact with no sign the attacking ship even sent a landing party to clear out the people on the planet. Rion briefly considers the perpetrators to have been salvagers, as the profession was notorious for its deadly rivalries during the Human-Covenant War. However, with the war over there has been no need for violent competition over the spoils of war, and Rion points out to herself the absurdity in destroying potential prizes to steal. Rion concludes therefore that the Office of Naval Intelligence was responsible for the attack. When the Ace of Spades arrives at Rion's position, she orders Niko to find a nearby communications satellite and find information on the ship that attacked the Roman Blue. Rion then leaves to take a shower. There, she starts thinking of her first job as a crewman on the cargo ship Hakon. There the aging condition of the senior staff led to growing disorder among the crew, with Rion killing a newer crew member, Sorely, six years into her service. Gaining full respect from the crew and the staff, she received training in how to run the ship, finally doing so when the two senior officers died. When Rion returns to duty, Niko gives her an update: the nearest comm satellite is orbiting Chi Rho, and the attacking ship is virtually undetectable when not in combat. Rion and Cade discuss the likeliness of ONI just happening on the ship at the same time as them. It doesn't fit, and they suspect they have been tracked ever since leaving Venezia. Moving to the issue of their exploration of the ship itself, Rion reveals to the crew having found information on the missing UNSC Spirit of Fire - that the Covenant ship Radiant Perception picked up a navigation buoy dropped by it to alert the UNSC of its intended course. Their salvage mission is thus changed to finding the Radiant Perception's wreckage and the buoy. As the Ace of Spades takes a slow course to the satellite over Chi Rho, Rion asks Kip for standard schematics for the CPV-class heavy destroyer. To make sure the mission is profitable and not just a personal quest, she plans on recovering its luminary. Kip has never heard of one, which he learns is due to a lasting taboo among ex-Covenant in discussing luminaries with the spiritually unclean. The entire crew is ecstatic at the prospect of being the only salvagers with the ability to detect Forerunner technology, and Rion serves out a rare bottle of Alt Burgundy to celebrate. While the others are away, Rion confides in Cade that they probably won't find the buoy, though the UNSC certainly would not have had time to recover it back from the Covenant. One of the Ace crew members, unknown at the time, sends a coded Hahn in regards to the recent discovery of the Roman Blue, revealing himself to be an ONI agent known only as "67159-021127". He suspects Hahn of being behind the glassing and informs him that Rion is aware of Radiant Perception's recovery of the buoy at the Battle for Arcadia. Rion sends a message to Nor Fel via the comm satellite asking about Covenant destroyers. Fal is hesitant to get involved as the Covenant remnants and pirates are more than willing to take out anyone who could recover a wreckage before them. Rion demands for money; having paid Nor for the location of the Roman Blue and lost equipment in the attack as well as the wreckage, she finds it a worthless sale. Aware of the Kig-Yar race's obsession with collecting things, she knows the threat of refund would make Nor more approachable. Rion quickly relaxes her demand and instead asks for the Covenant Navy's logistical records on the Radiant Perception, particularly relating to its current fate. Rion is more sure of success this time, as its active career so early into the war would show a decent record. Kip, Lessa and Niko continue their search through comms logs and UNSC archives for references to the Radiant Perception. Cade meanwhile messages old service pals looking for anyone who remembers the name in passing. Kip is annoyed at his lack of findings. As the ship was part of the first wave at the war's beginning, its movements would have been especially noteworthy. However, he has found significant gaps in the logistical accounts. Rion reminds him that glassed colonies don't have good records. Rion gets a transmission from Nor, which she has directed to her quarters. Nor finally has information on the ship. Based on her findings, it crashed on the planet Laconia in February 2531 shortly after the engagement with the Roman Blue, which Rion concludes as them having had no time to transport the buoy to another ship. The Covenant refused to salvage the ship when they found the Mgalekgolo had murdered the survivors and multiplied exponentially. Now Nor's service to Rion is complete, she gives her the bad news: another salvage crew has disappeared. This time it is Ram Chavla's after transporting Forerunner technology over the glassed Mesa. Nor suspects various crews over the past year have been killed on the orders of Gek 'Lhar, a Sangheili commander and salvager loyal to Jul 'Mdama. As a crashed Covenant ship, the Radiant Perception is the kind of artifact he would be looking to salvage. The Ace of Spades approaches the Procyon system. Arcadia, Rion notes, is more plasma scorched than other worlds due to the Covenant being needlessly excessive in the glassing process of this planet-sized vacation resort. The nearby planet Laconia meanwhile is observed as a cold, volcanic world that was completely ignored due to its lack of human habitation. The crew observe Laconia more closely to find the wreckage of the Radiant Perception. Finding the Radiant Perception, they observe that its power core is still operational and providing auxiliary power. They spot that a well-armed Covenant freighter is also on the planet. Life signs are detected on the planet, which Rion reads as proof Gek 'Lhar is on the planet. The crew get ready to land on the planet and walk the projected three kilometers to the wreckage. Niko announces the completion of a buoy detector he calls "Diane", which will identify any object broadcasting on any radio frequency. Rion notes that one of the life readings has not been identified, and assumes it to be the Lekgolo colony Nor warned her about. Though they could wait for the creature and the Sangheili team to destroy one another, she and Cade agree that that the Sangheili could call for reinforcements and they must see themselves on a time limit. However, Cade ruins Rion's plan to recover the buoy from the bridge undetected by revealing the assumed four meter tall Mgalekgolo's life signs are coming from that very area, and that it is highly likely there is a second one evading detection. Needing a new plan, Rion suggests using a set of retired Sangeili active camouflage devices they received from a group of Zealots six months prior before a trip to Shaps III. Cade and Rion walk along Laconia's volcanic surface. As they approach the Radiant Perception, it becomes clear it was downed by a MAC round to the midsection, towards the bow. They enter the ship through the hole, quickly finding the corridors filled with corpses. Past the landing bay, they find the two Mgalekgolo, with one judged to be dead and the other dying and unmoving. Leaving Cade to observe the living Mgalekgolo, Rion checks out the equipment in storage at the bridge. When she stumbles onto the buoy, the creature wakes up and stomps its legs, challenging her. Cade shoots it from behind, triggering it to prepare to charge at him instead. He is frozen with terror at the sight of the creaure coming at him and is knocked down. The creature quickly dies after Rion shoots it, too old and weak to continue. She suspects the death of its bond had had a serious psychological affect and it wanted to die. As Cade and Rion get ready to leave the ship, they detect the approach of the Sangheili team, who they theorise also learned of the Mgalekgolo's death. Cade is bleeding after his fight with the Mgalekgolo and has an argument with Rion over his competency. Rion insists he is perfectly fine, but Cade is ashamed that he was so scared of a Mgalekgolo near its death and not those in their prime he encountered during the war. The two return to the Ace of Spades without incident, though Rion is left wondering just why the Sangheili didn't go after them. As the crew celebrate their recovery of the buoy, Kip alerts them to the approach of a human lifeform. Rion identifies the figure on sight as Ram Chalva. Moving her sights to the Covenant freighter, she spots a large Sangheili directing the others in firing at Ram. Rion quickly deduces that he is their prisoner and they are using him as target practice, sending him running to the only other humans on the planet to get their attention. The Ace of Spades takes off from the surface and flies towards Ram in the hopes of giving him a fighting chance. It touches down again briefly to allow him to get aboard. Rather than escape, however, Rion orders the ship's weapons be activated and aimed at the Covenant freighter. Unwilling to fire a missile in case the Radiant Perception it hit by debris, Rion opts for the autocannon. At this moment, the Covenant freighter captain works out their plan and orders three dropships to launch. Beaten, Rion orders their departure. ONI agent 67159-021127, now revealed to be Kip, makes another transmission from the Ace of Spades to Hahn. He thinks about the recent bioterrorist attack on Sedra where his family was killed including his partner Talia, who was six months pregnant when killed. Hahn approached him, then known as Silas Kipley, then a drunken wreck and offered him a chance to use his engineering genius to help humankind recover from the turbulent post-war environment. Agreeing to Hahn's offer, he was to be given a job on a salvage ship, where he would keep ONI up to date on their recovery of dangerous equipment to make sure it stays out of the hands of terrorists. It was then his name was changed to Kip Silas. Kip understands none of the crew has terrorist sympathies, but also knows that Rion is too good at her job and that a very profitable haul inevitably means more weapons flooding the market. Rion checks up on Chalva, who is being heavily medicated to treat the deep cuts all over his body and the tissue damage from plasma exposure. He is placed in a cryotube to keep the pain away as they head back to Venezia. Obtained lock on her signal. Covenant ship leaving Arcadia, preparing slipspace jump. Intercepted communication... Hard coordinates obtained. The coordinates surprise Rion greatly. The Spirit of Fire's role in the Battle for Arcadia was little understood, let alone what happened after. The coordinates indicated it successfully left the system into uncharted space, explaining easily why no wreckage was recovered. Rion's happiness is cut short however when Lessa notifies her that the Covenant freighter is on approach. This section needs expansion. You can help Halopedia by expanding it. The cover of the novella was illustrated by Nicolas "Sparth" Bouvier. 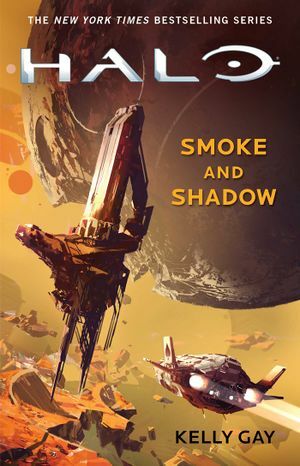 Due to an error caused by the author's name, on November 15, 2016 Smoke and Shadow was listed on Amazon as the 14th bestselling book in the LGBT science-fiction genre. ↑ Twitter.com, "@toa_freak I just saw that too. It's b/c of my name. Happens quite a bit. I'll see if we can rectify that. Thx!"